Video: What is Volvo world premiering tomorrow? Volvo inform us that, tomorrow, May 17, they'll be debuting a world premiere. Along with that information comes along two teaser videos which are as mysterious as what the new car could be. Yes, that's the first thing cleared up. Volvo is definitely premiering a new car and not a truck. From the general tone of the teaser videos, we can ascertain it's a car. And also, Volvo CARS US were the one's who tweeted this out so we're sure it's a car. Now as to what the car may be, we're as clueless as you are. However, we can take an educated Sherlock Holmes style investigation. To begin with, both the teaser videos were shot outdoors with some beautiful mountains and a crystal clear lake as a background. That rules out the performance oriented models such as the Polestar and the R-Design. It also rules out sedans as Volvo generally reserves outdoor filming for their station wagons or SUV's or crossovers. 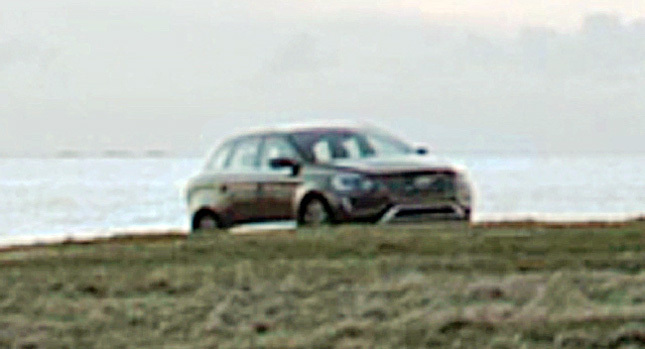 The Volvo V40 Cross Country commercial, for example, was shot in a similar setting. The car in the background of the second teaser tells us that it is a crossover/SUV. Towards the end of the second teaser, we can see a Volvo crossover parked in the background. Our friends from CarSccops have enlarged the image as you can see it here. We don't think it would be the XC60 as Volvo has only recently refreshed the entire model range and the world premiere of that happened in the 2013 Geneva Motor Show. As far as the all new XC90 is concerned, it is not out until later next year and as a result it is ruled out as well. So what is the all new Volvo that will make you 'Leave The World Behind'? We checked the official website and Volvo say that the Swedish House Mafia are starring in it as well. Whatever it is, we need to wait until tomorrow to find out. Stay tuned to Indian Autos Blog for the updates!